I like Gracie's outfit the best, although they were all really good! 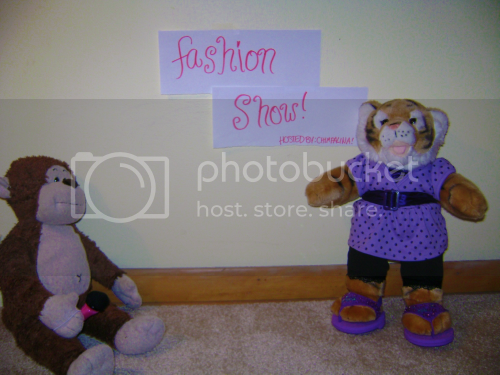 I guess I'll vote for Paws, because her clothes are purple, which is my favorite color :P.
Cool blog!!! Hugs, BunnyFuzzyPal7 x.
I like Paws the best. I have an outfit like that in real life! Oh. And my fave color is purple. Oh, the pony is well over 10 years old; it's at least twice that age! I either bought it used or traded for it a year or two before that road trip, heh. By the way, Tessa, if you're looking for someone whose pets you can put in your story, I'd be happy to contribute something . Edit: Oh yeah, the last time I updated that site was in 2003, so it's kind of rotting. Most of my recent stuff on there is in other folders. Last edited by Rainribbon; 05-18-2010 at 08:26 PM..
Well thank you very much. I know, i'm quite adorable. Oh, Chimpalina. I agree though, you are pretty cute! That'd be cool! What kind of a bear is Alli? Update coming very soon everyone! 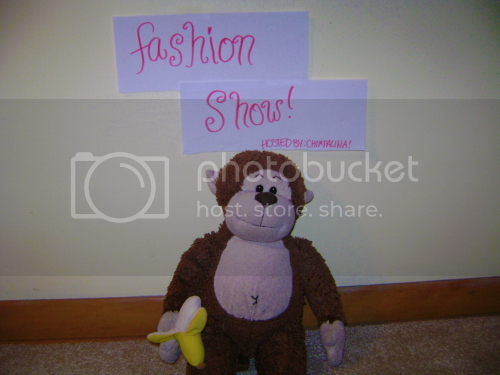 Update 1: Chimpalina's Fantastic Fashion Show! Hello, and welcome to my very first update! 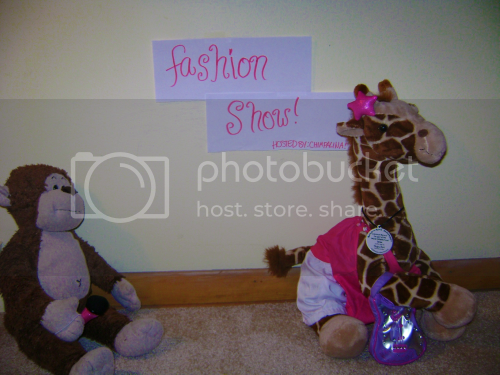 Well, today when Tessa was at school, me and a few of my cousins decided to have a fashion show! A warm welcome to them! So, let's get started! Uhh, Chimpalina? Why are you holding a banana? Okay Chimpalina, we get it. On with the show. I'll be the announcer and a judge, and Tessa will be a judge too! And, we even may have a special guest judge! I wonder who it will be? SHH! TESSA! We don't want to ruin the suprise! First up, is the lovely Freya. She is wearing a nice pink striped top with pink glitter jeans. She is also wearing some amazing pink metallic converse! Nice outfit Freya! Will you describe why you chose this outfit for us? Yes! I chose this outfit because it's purrrfect for spring. Not to warm, not too cold with great spring colors. Thanks Freya! Next up, we have Paws. 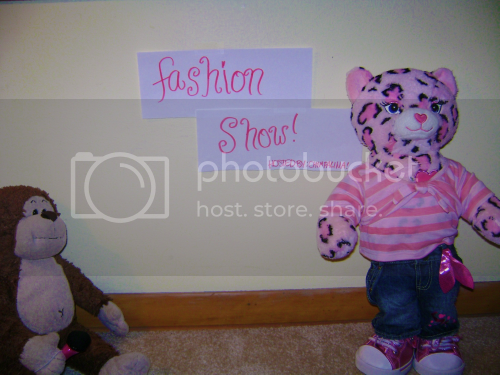 Paws is wearing a purple polka-dot belted top, with black leggings and purple gem sandals. Stunning! Paws, what's the reason behind your outfit? Well, I picked it because it's casual yet stylish. You could relax in this outfit or go to a party! Thanks! Last but not least, we have Gracie. Gracie is wearing a lovely pink gem tank, white jeans, is carrying an amazing Hannah Montana guitar bag, and she even has a star clip on her...her...thing up by her ears! I think those are her horns, Chimpalina. Horns, things-by-her-ears, whatever. She's wearing a star clip on whatever they are. So, Gracie, would you care to describe why you chose this outfit? 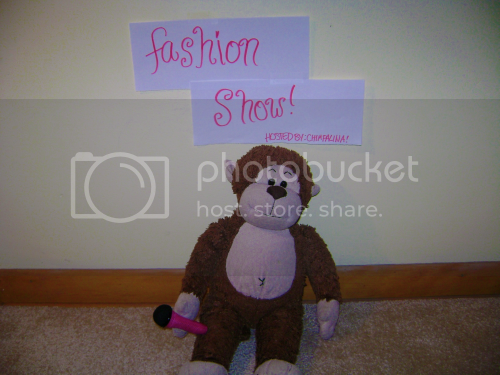 I picked this outfit because it's very stylish for this time of year, and it's perfect for my body shape! Being down on all fours, sometimes it hard to find clothes that flatter! I know what you mean. I prefer to run around naked. It's much more comfortable! Anyways, that's all of the contestants! I'll submit my vote, and Tessa will submit hers, but ONLY after the guest judge submits theirs. The guest judge is...YOU! 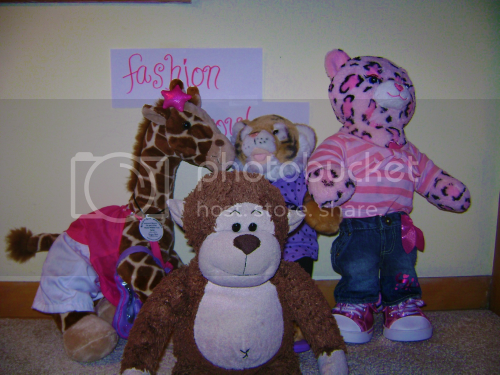 Vote by posting which outfit you liked better...Paws (or you can just say Tiger), Gracie (just Giraffe is okay), or Freya (leopard) and the results will be posted next update! That's all fur now! Bye until next update Bearville Insider, and don't forget to VOTEVOTEVOTE! Cool! I'll VM you about it. Cool! The Pink Sweet Cuddles Teddy is adorable. But not as adorable as me, right?!? Keep votin' away! New update coming SOON!